Should I own a “Race Gun”? A “Race Gun” is a gun designed for the fastest and more accurate shooting possible in a competitive situation. Other considerations like ability to carry, concealability and even safety (just a little) are secondary. 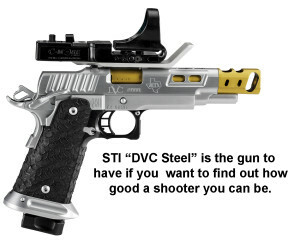 A race gun should, definitively, not be you first gun or purchased if you are still not comfortable with fast shooting. 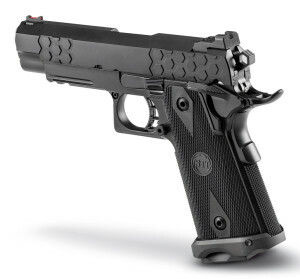 Their very low trigger weight may cause an inexperienced shooter to unintentionally double tap and the low recoil and optical sight may spoil him/her into bad habits hard to get rid of when using a normal handgun. Why having one then? Obviously the first case is intending to participate in “open gun” competitions. You do not want to lose and get frustrated just because you are using inferior equipment than your competitors. The second, very powerful reason is finding out how good you can become as a shooter. By removing recoil, accelerating reload and providing a high visibility sight these guns in the hands of top Steel Challenge shooters can hit five 10” plates between 30 and 60 feet away in around two seconds! A lot of fast shooting challenges can be safely and easily simulated in the range providing a lot of fun. 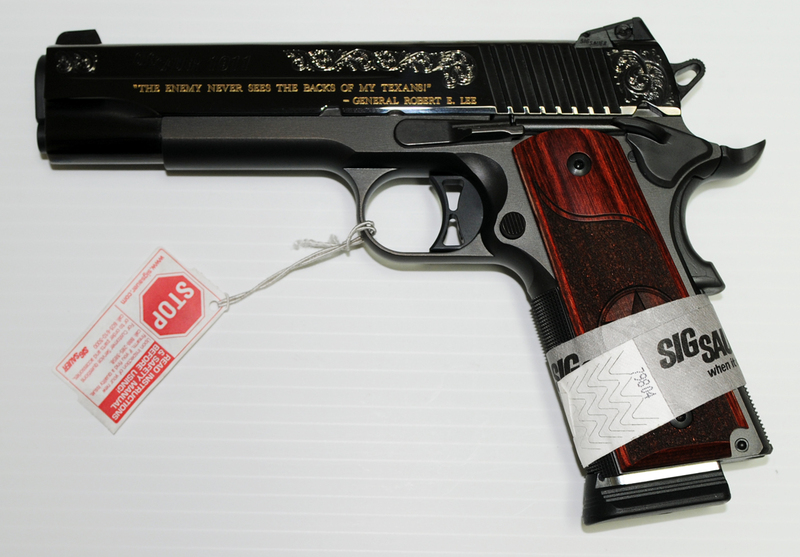 Please call us (281)384-1482 if you are curious about Race Guns. Below is a picture of a new model, the STI DVC Steel ($3,599) that epitomizes the current race gun configuration and capabilities. THE SCOPESMITH APRIL 2017 NEWSLETTER: YOU WANT IT? WE HAVE IT! – FIELD RESULTS OF NEW EXCITING GUNS – KAHLES SCOPES IN THE STORE! You want it? We got it! Many new and hard to get guns now in stock! We have received some long-wait items in the last few days including the new Ruger Precision Rifle in 223/556 caliber and the hard to get 6.5 Creedmoor version. Also the FN SCAR 17S, the HK 761A1 and 556A1 (arguable the best combat AR platforms there are). 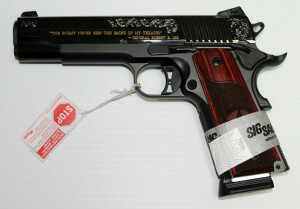 Also the very collectable Sig Texas Gold and the wildly successful Hex-Tac 9mm pistols from STI. Please check our gun room often to keep track of those arrivals! Field results are back! New must-have AR platforms performed to the highest expectations! In the last three weeks we have being testing two new semiautomatic guns that quickly became Scopesmith favorites. The first is the Seekins SP10 24in 6.5 Creedmoor. 100% reliable and offering bolt action accuracy from a semiauto firearm (1/2 MOA)! We tested the gun ourselves confirming the feedback we had from several customers. $2,449 Credit, $2,400 Cash! The second must-have new AR is the CMMG Anvil in 458 SOCOM. I was recently asked: The 458 SOCOM is being out for a while, why you like it so much now? The answer is: in the past 458 Uppers were unreliable requiring messing with the buffer spring from you lower and also their bolts were weakened versions of 556 bolts milled out to the new dimensions. The CMMG Anvil is designed as a 458 SOCOM from scratch, its bolt is based in a stronger 762 bolt and it is finely tuned to work with the wide range of 458 loads. On the field we found ZERO MALFUCTIONS and 1 MOA accuracy both amazing results for a chubby 300 grain cartridge with a low ballistic coefficient bullet. Two models in the $1,700-1,900 range! Finally, Kahles scopes in the store! A great brand that now has a better US support and service by being distributed by Swarovski! Two base models: a 5-25×56 Front Focal Plane ($2,999) and a 1-6×24 ($1,999). A unique feature in the Kahles scopes vs. other high-end brand is their lighter weight (their 6-24×56 is around 7 ounces lighter that a Nightforce or Schmidt&Bender 5-25×56). Another interesting feature useful to LEFT HAND SHOOTERS in the option (in the 5-25×56) to have the windage turret on the left! Special pricing available for in-store purchases! FOLLOW US IN FACEBOOK. Is being only a few weeks since we joined Facebook. We have maintain discipline in keeping it updated and using to communicate tips, range results and new product arrivals in a way that is not practical in newsletter format. Please check it out and follow us!